Easter is one of my favorite holidays. I love to surprise my kids with fun gifts, but I really don’t want to deal with the aftermath of a gift basket full of chocolate—anyone else get me? 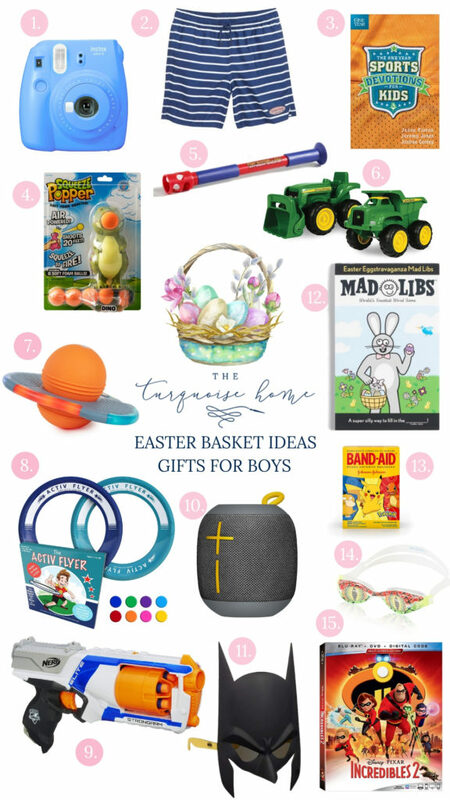 Here are some great gift ideas that are not candy for Easter so you can have some choices that they will love, but don’t involve a sugar crash meltdown. All links are denoted with hot pink type, just so you know how to find the items I’m sharing! These links are affiliate links. See my full disclosure policy here. One of my favorite parts of Easter is seeing my girls all dressed up in their Easter dresses at church! The other has got to be handing them their Easter baskets! 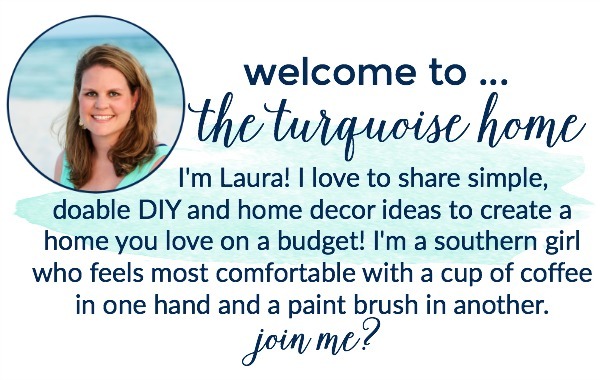 I always try to give a mix of practical and fun goodies, while toning down the sweets. 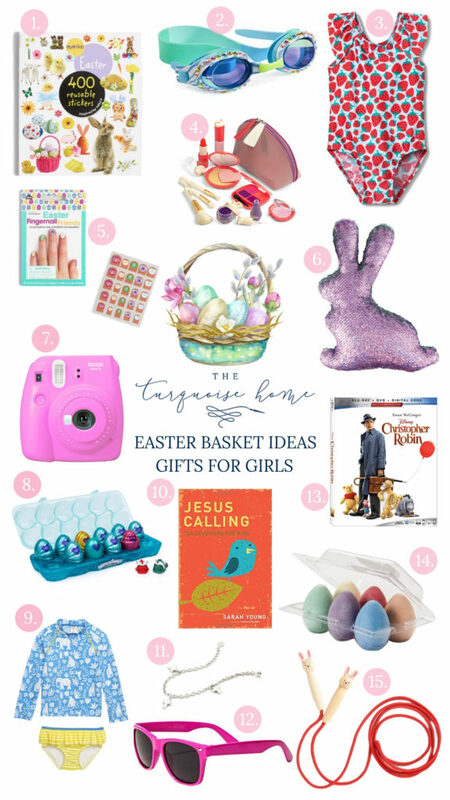 Here are some of my favorite Easter basket ideas for little girls. World Market sticker book – girls love sticker books—this book is great because all the stickers are reusable! Bling 2O googles – Easter is a great time to give your kids summer items that they would love! If you have a girly girl these are not only super cute but practical also. Strawberry Swimsuit – Another practical and cute gift is this sweet strawberry swimsuit. The pattern here is just too sweet! Nail Art Stickers – Raise your hand if you want an at-home mani. Girls will love applying these Easter nail art stickers from World Market. Magic Sequin Bunny – Nordstrom always has the coolest items but this little bunny is too fun! The sequin colors change from purple to green and back with the swipe of your hand. Instax Mini – This is one of my favorite items on the list! This cute camera is only 5 inches tall and 5 inches wide, making it perfect for tiny hands. This is a great way to encourage creative habits in young girls, too. Hatchimals CollEGGtibles – I’m not quite sure I get the Hatchimanls obsession but my kids loooove them. These come in eggs, so they are definitely appropriate for Easter. Mini Boden Rashguard – We always put swimsuits in the kids baskets – love the rash guard and print! Jesus Calling for Kids– Easter has all kind of fun activities and goodies, but when it comes down to it, I want to make sure my kids know the real meaning of the holiday. 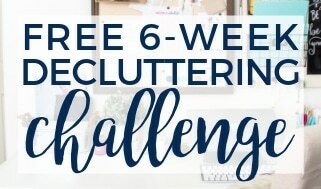 This is a great devotion to do daily with your kids all year long. Silver Cross Bracelet – This sweet silver cross charm bracelet from Nordstrom is too perfect! Stylish Girls Glasses – If you are looking for some practical filler items, these sweet sunnies only cost around $5! Christopher Robin Movie – This is one of our favorite movies to watch together any time of the year—your kids will love it. Easter Egg Chalk – This is a great way to get kids outdoors in these beautiful spring days. Bunny Jump Rope – Such an adorable gift—plus, these jump ropes are perfect to burn off some of that Easter candy energy! Boy Easter baskets are so much fun to put together! Again, a good mix of practical and fun is what I like to go for. As a bonus to everyone in the house, it’s also great to have some items that help boys burn off some of their seemingly unlimited energy! Instax Mini – Again, I love this little camera! This would be such a fun gift for a little boy that he could use all year long to document adventures. Swim Trunks – These Vineyard Vines boys swim trunks are classic and stylish. Sports Devotional – The stories in the devotion are incredible and interesting for little boys but all Christ centered. A GREAT gift. Squeeze Popper – This little guy shoots balls 20+ feet. Thankfully, the balls are pretty soft, so fairly safe for all! Marshmallow Shooter – Perfect gift for the boy in your life – a marshmallow shooter! Tractor Sand Toys – If you have a sand pit or are taking a beach trip this year, this is a great add-on to the Easter basket. Pogo It – I literally cannot think of another thing that would entertain and effectively exhaust a kid (in a good way)! Flying Rings – These are one of the top gifts on Amazon. Great Easter basket gift for the boy on the move. Nerf N-Strike Elite Strongarm Blaster – This is a great toy to encourage your kid to get outside and play with friends. Bluetooth Speaker – If you have a little music-lover in your life, this speaker is portable and stylish. Superhero Mask Sunglasses – Sunglasses for the superhero! Mad Libs – Boys love Mad Libs! And this fun treat is less than $5! Bandaids – You really can’t get more practical than bandaids for a little boy, but with these fun Pokemon designs, they may not even notice! Fun Goggles – These are almost guaranteed to make your little man giggle. Incredibles 2 – Such a fun movie! This is one I don’t mind watching again and again. Oh, my stars! Just thinking back to when my girls were little with their sweet Easter baskets make me a little emotional. These ideas are fun, practical and just too cute. 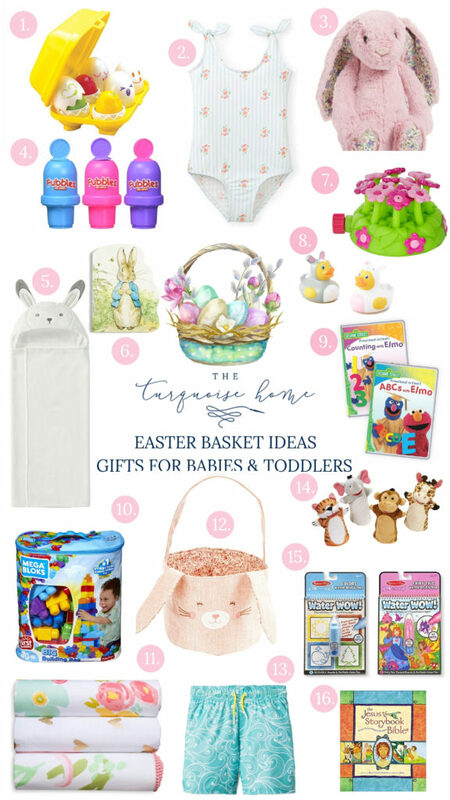 Here are my favorite Easter basket gift ideas for toddlers and babies. Hide & Sqeak Egg Toys – My nephews have these and my daughters still play with them every time we go to visit! Cute learning Easter egg toys for preschoolers! Swimsuit – This little swimsuit is so sweet! I love the pattern. Bunny Jellycat Plush – Jellycats are all the rage! They are so cute and super soft. This Blossom Bunny is adorable! No-Spill Bubbles – Bubbles are the way to a preschoolers heart! These are no-spill and are fabulous Easter basket ideas! Critter Baby Bath Towel – You haven’t lived if you’ve never held a baby wrapped in a hooded towel. This little bunny will melt your heart again and again. 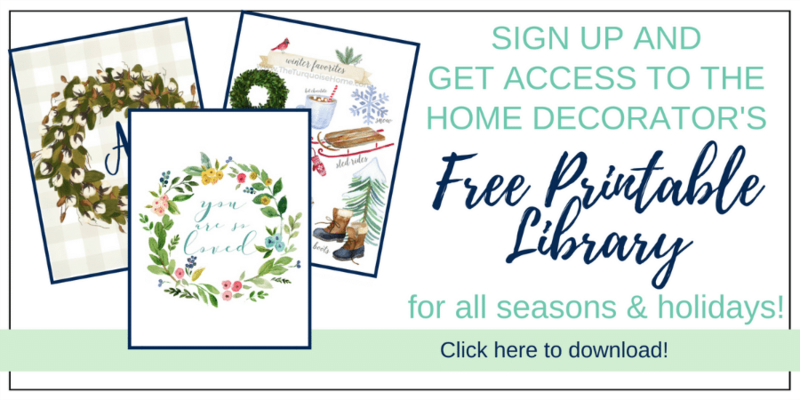 Peter Rabbit Board Book – Another bunny gift that your little one will love. These pictures are so pretty, too! Sprinkler Toy – This toy is the perfect toddler-friendly way to get out and enjoy the water. Easter Bunny Rubber Duckies – Is there anything cuter than these Easter rubber ducks? Educational DVDs – Fun and educational Sesame Street DVD’s for home or the car. Mega Bloks – Babys love to stack and this is great for their mental development too. Muslin Swaddle Blankets – These Target finds are some of my favorite baby blankets! Linen Bunny Basket – A traditional wicker basket may not excite a young child, but this little bunny definitely will. Plus, if you have a Cricut you can add her name to the ears! Boys Swim Trunks – How cute are these little trunks? Such a great Easter basket idea for toddlers! Finger Puppets – This will entertain your little one for hours and hours. Super cute! Water WOW! Books – These are like the intro to coloring books. These books come with water pens—when they are squirted onto the page, a color or design shows up. Jesus Storybook Bible – This is my favorite book to give to anyone at any age. The Jesus Storybook Bible is great to start reading to your babies and continue through elementary school. Buy several for your kids, give to friends or new parents. 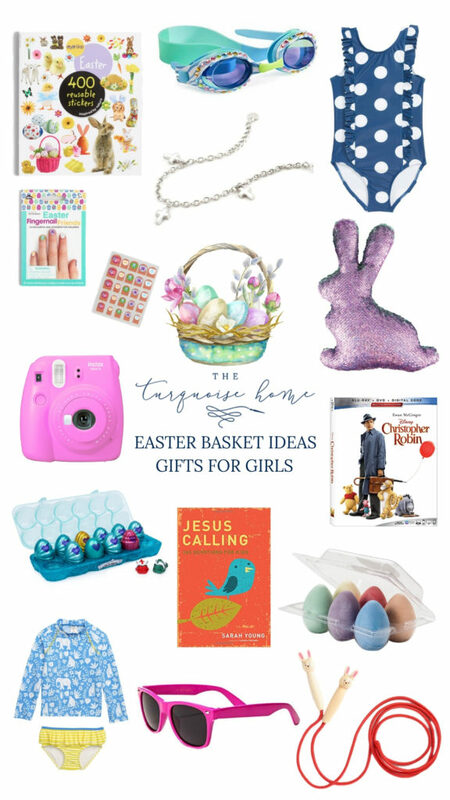 Which one of these Easter basket gift ideas that are not candy are you most excited about? I just love them all! What great ideas for Easter baskets. My babies are teenagers now but I saw a few ideas I could use IF I decide to make them a basket. What about for older boys? ?